A portable BBQ is ideal for an impromptu outdoor meal. They allow you to easily enjoy an al fresco meal in the privacy of your garden or socialise at the nearby park. Wherever you use it a portable BBQ is the perfect sunshine accessory. A portable BBQ should include everything you need for outdoor cooking. The perfect mini BBQ would include a space to store and prepare food as well as a lid for securely closing the BBQ during transit. Portable BBQs come in different styles and sizes. Although many lack the added extras of a larger BBQ, portable models make up for it in design. Some can be placed safely on any surfaces, such as table tops, for added convenience. It is important to clean the ash out of a portable charcoal BBQ after use. Selecting one with a removable charcoal tray will make this much easier. After you’ve finished the BBQ, douse the hot coals with water to make sure they are cool, wrap them in tin foil, and bin them. However, portable gas BBQs are more convenient with less mess. Just like using a cooker at home, simply turn the gas on and you’re ready to cook. A small camping BBQ brings people together in the great outdoors. Pack your portable BBQ and cook a meal for the family with ease. You can cook an authentic meal over charcoal next to your tent or caravan. Check the campsite guidelines for rules on cooking on a BBQ. Don’t put the fire too close to your caravan or tent and consider the direction of the wind when placing your BBQ. DO NOT light your BBQ inside your tent – it can not only cause a fire, but it may also create a build-up of carbon dioxide. Got limited space? A portable BBQ can easily be placed on your balcony or set up in a local park to enjoy an urban al fresco meal. Outdoor living is in, regardless of when and where; put the cider on ice and mix the gin cocktails for the perfect summer party. Invite your friends and head to the park to heat up the portable grill. 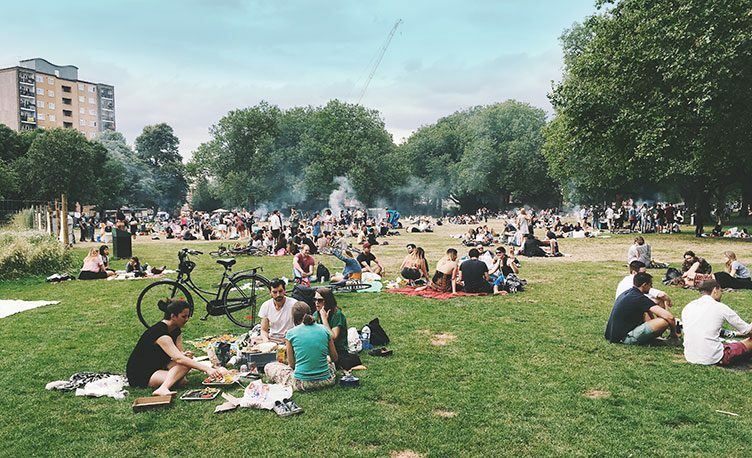 Parks in the summer have a great atmosphere, filled with plenty of sun-worshippers out to have fun. Beware of people around you – the smell of a good barbecue may cause jealousy. But do make sure you check local guidelines about using a BBQ in a local park before heading out. Recreate an Australian BBQ by cooking on the beach. Raised portable BBQs are the best style for beaches as cooking on the sand or pebbles creates lasting heat that can burn other people’s feet once you’ve left. After you have finished cooking, make sure to cover the hot stones or sand. The disposable BBQs at petrol stations are cheap, cheerful, and will work for cooking a bacon sandwich. Although to enjoy the perfect outdoor meal, you’ll need something more substantial. A disposable BBQ is more likely to char as the food sits close to the fire. Dripping fat will increase the risk of flare-ups which can result in the food looking black instead of brown. You may also find that food sticks to the grill. Disposable BBQs can also burn the grass underneath them and aren’t currently environmentally friendly. Portable BBQs are easier to use, light, and often include a larger cooking area as well as heat resistant handles. In addition, portable BBQs are more environmentally friendly and some have a very stylish appearance. 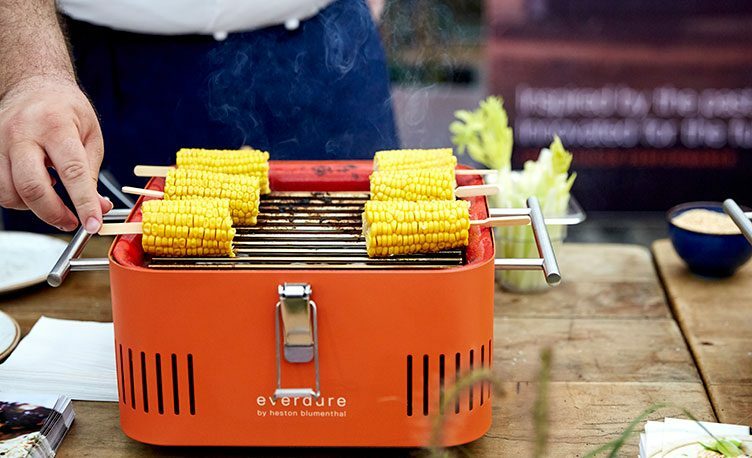 Enjoy a classic burger with Heston Blumenthal’s own recipe cooked on a CUBE BBQ. Melt cheese slices onto beef burgers and serve up with a delicious sauce, vegetables, and brioche burger bun. Cook a vegetarian or vegan BBQ meal with the Romaine lettuce vegetable wedge. This delicious, healthy side includes peppers and mushroom as well as a tasty dressing. Serve a delicious steak on top of a pain de campagne. Finish with a mustard vinaigrette and blue cheese. Easy to prepare and simple to cook, it is the perfect summer lunchtime meal.